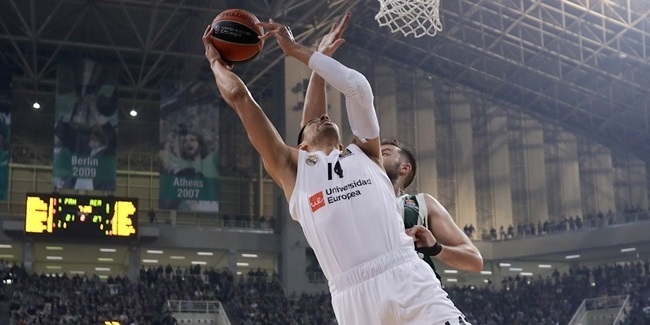 Gustavo Ayon delivered a magnificent all-round performance to lead Real Madrid to a comeback victory over Anadolu Efes Istanbul on Friday night. 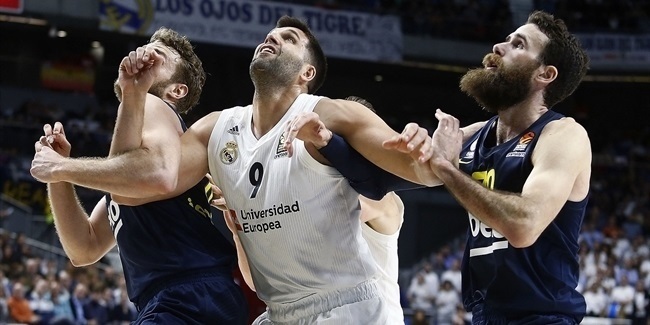 Ayon scored 20 points on 10-of-11 two-point shooting, including 8 points in the fourth quarter as Madrid overturned a 15-point deficit to win 82-84. He completed a double-double with 11 rebounds, and also added 3 assists, 2 steals and 2 blocked shots for a PIR of 34, earning the MVP of the Round award. Coming a close second was Ayon’s direct opponent Adrien Moerman, who amassed a PIR of 33 after scoring 18 points for Efes on 5-of-6 two-point shooting and 3-of-4 three-pointers, as well as 10 rebounds, 3 steals, 1 assist and 1 blocked shot. Another losing player registered the third best performance of the week, with AX Armani Exchange Olimpia Milan big man Arturas Gudaitis claiming a huge double-double with 16 points and 17 rebounds – including 10 offensive boards – for a performance index rating of 32 in his team’s home defeat to Herbalife Gran Canaria. Gudaitis’s teammate Mike James had a PIR of 26 after combining 26 points and 8 assists. The list of the week’s top performers is rounded off by KIROLBET Baskonia Vitoria-Gasteiz center Vincent Poirier, who had 18 points, 8 rebounds and 2 steals for a PIR of 25 as his team outlasted CSKA Moscow in a 76-73 thriller. In the same game, CSKA’s Cory Higgins also had a PIR of 25 by combining 17 points, 4 rebounds and 3 assists. Milan's James led all scorers in Round 9 with 26 points, but injured Khimki Moscow Region guard Alexey Shved remains the season leader with 25.3 points per game. Gudaitis had 17 rebounds, the most by a player in a game this season, and took over the lead among league leaders for the season with 7.5 per game. Stefan Jovic of FC Bayern Munich led Round 11 with 9 assists. Nick Calathes of Panathinaikos OPAP Athens remains atop of assists charts for this season with 7.7 on average. 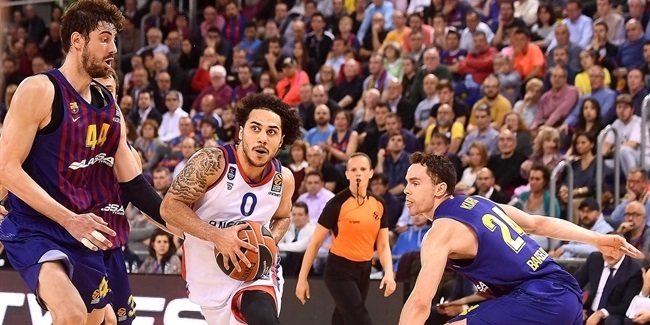 Six players had 3 steals this round: Moerman, Petar Popovic of Buducnost VOLI Podgorica, Adam Hanga of FC Barcelona Lassa, Charles Jenkins of Khimki, Dairis Bertans of Milan and Xavi Rabaseda of Gran Canaria. Shved is the new season leader in steals with 1.8 per game. Tarik Black of Maccabi FOX Tel Aviv led all players with 5 blocks, a season-high in the competition. Madrid’s Walter Tavares leads the EuroLeague with 2.2 per game. Four players had a double-double in Round 11: Maccabi’s Johnny O’Bryant with 12 points and 14 rebounds, Gudaitis (16 and 17), Ayon (20 and 11) and Moerman (19 and 10).